Email marketing starts with collecting opt-in subscribers but the ultimate goal of your list building strategy should be getting lifetime customers. The actual measure of your marketing success is not your subscribers’ list, it’s your customers’ list. So, getting opt-ins is important but what is more important is to communicate with them, show them your appreciation, and do your best to help them achieve their goals. You’ll develop a long-term email marketing program to maintain your customers but it all starts with the welcome email. Engaging new subscribers is as important as collecting opt-ins in the first place. Below are 5 tips and best practices for creating and sending welcome messages. 1. Treat subscribers like human beings. Sometimes marketers do not bother to send a welcome email to new leads. They think a “Thank you” page after the user subscribes or creates an account is enough. On our opinion, by sending a welcome message you acknowledge the user’s existence and show them that you are ready to provide them with a good customer service. Your subscribers would appreciate a cordial welcome. Like all human beings the subscribers love to be guided and acknowledged. So, if they opted in to your newsletter, your welcome message can remind them what information and how often they will receive from you. If they created an account to try your service, your welcome email can confirm that the account is created successfully and tell them what to do next. 2. Strike while the iron is hot! The subscriber’s interest is highest immediately after they opt in. Therefore, the welcome email is the best opportunity to get them engaged. Offer a helpful quick advice to teach them how to benefit from your product and discover the value of your product or service. The more benefits you show them, the more subscribers will be converted into customers. 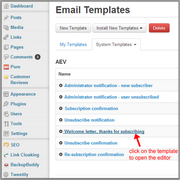 The sooner you send the welcome message to the subscriber, the better. On our opinion, sending it in say 10 minutes after the user subscribed is already too late. The welcome email confirms that the user took the action and it was successful. It’s like you are congratulating them. You can even start your welcome email with “Congratulations! You successfully subscribed to our newsletter at www.yourdomain.com”. The speed of sending the welcome email is even more important if your subscribers are waiting for a free download, e-book, report or video. Not only does this help the subscriber’s engagement, but it also confirms that your subscription process is working smoothly. If you do not send the welcome email in a timely manner, they may think your service is slow or bad. A good practice is to reward the users for their subscription and encourage new leads with a discount. Do not think your subscribers are not willing to take an action now. Sell them in your welcome email, gently. Provide them with a subscriber-only offer in return for their subscription. 5. Give them useful resources. Consider the welcome message as your business card and include the link to your website into it. People are sometimes forgetful. So, if they forget something about your company or products, they will be able to find the link to your site in their welcome email and visit your site for more information. If they created an account with you, include a link to your login page; if they subscribed to receive a report, e-book or product, give them the link to the page where they can re-download it and also include links to useful articles, tutorials or video guides related to the downloaded product. Plus, you can provide them with a link to your support page and user forum where they can get help or ask any questions they may have about your service. Our newsletter plugin WPNewsman comes with the pre-configured welcome message that you can however customize to fit your email marketing needs and target audience. and start building your in-house email list right away! Download our PDF eBook and learn how to collect more leads and send highly responsive emails for free to grow your business. Don’t put your profits in the hands of third party email services, be in control of your email!